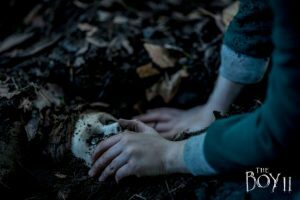 The first image has been unveiled from The Boy 2 and it shows the return of Brahms. Oh no! He’s being dug up and that only means one thing: more terrifying events are on the way for a family who’ve made a terrible mistake. Directed once again by William Brent Bell, the film follows a family who moves in to the Heelshire Mansion unaware of its haunting past. When Convery’s character befriends the lifelike doll Brahms, strange things start to happen. Principal photography began in January with The Boy 2 heading to AFM on 31st October 2019. The film stars Katie Holmes, Ralph Ineson, Owain Yeoman and Christopher Convery.